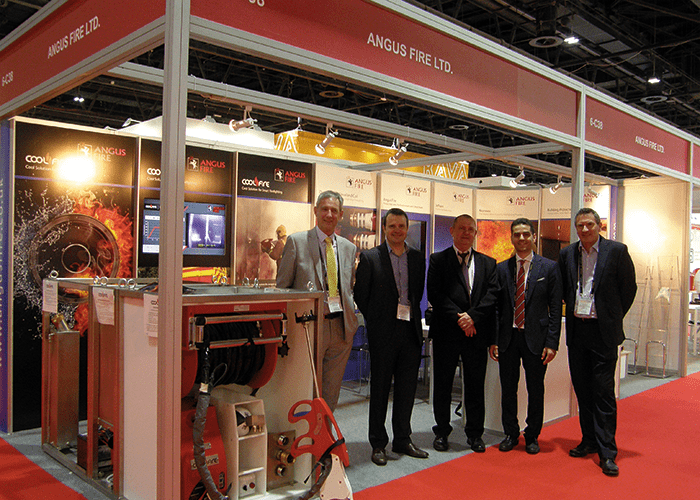 Angus Fire showcased its recently developed CoolFire system at Intersec last month. If you had the chance to visit Angus Fire’s stand you had the opportunity to view the CoolFire skid in detail and get to know the ins and outs of the system. For those of you who didn’t make it to Intersec, CoolFire is an innovative, rapid response technology which provides a firefighter with the advantage of being able to attack fire from a relatively safe position outside a building or structure. Because of its ability to penetrate virtually any material, CoolFire gives firefighters a huge flexibility in where they can attack a fire from (up through a concrete floor, sideways from an unaffected structure, for example) – a choice that is usually aided by the use of a thermal camera system to pinpoint hot spots and hot gas build up. PPV can be used to carry the water mist through complex structures and/or clear residual steam or smoke. CoolFire cuts through building materials using a mixture of cutting abrasive and water to gain access to the fire without introducing oxygen into it. Once CoolFire has cut through the building it creates a water mist inside, which suppresses and reduces the fire, cools and condenses fire gases and quickly reduces the temperature to allow safe entry. Angus Fire management team at Intersec next to the CoolFire skid. This technology has been specifically developed to meet firefighters’ varied needs, most importantly to make their job safer by eliminating the risk of backdraught and to increase firefighting performance. Compared to similar cold cutting systems in the market CoolFire is by far the preferred choice as it is modular, lightweight and simple to operate. Its light weight ensures quick deployment and recovery after operation. The modularity and simplicity of the CoolFire system means it can be customised to suite specific requirements and environments. It can be fitted to almost any size of vehicle from new build to a retrofit installation. The choice of PTO powered or engine driven skid systems gives further flexibility in terms of deployment and vehicle choice. It can be skid mounted, retro-fitted to existing vehicles or designed into new vehicles. Coolfire can be supplied with an integrated power pack (with diesel or petrol engine) or run from a vehicle PTO. The system is ‘plug and play’ with each module being an individual ‘line replaceable unit’ requiring only basic training and no specialist tools. In the event of a module requiring service or repair it is simply ‘swapped out’ with a replacement unit. The use of lightweight abrasive bottles eases the operators’ task considerably and simplifies storage and logistics. It is a virtually maintenance free system which only requires low levels of training and operational support. As a result CoolFire guarantees low running costs. CoolFire is a system which has been engineered for versatility, reliability and value for money. Angus Fire has been a global leader in firefighting technology for more than 200 years. Products branded with Angus Fire are used worldwide in the petro-chemical, oil and gas and off-shore sectors as well as international airports, harbours and ports, military bases, power stations, and of course fire and rescue services. Angus Fire is known for manufacturing reliable products to provide the best protection for firefighters. CoolFire is the latest technology developed by Angus Fire following widespread consultation with firefighters around the world. This new technology is now available for demonstrations in the Gulf region.